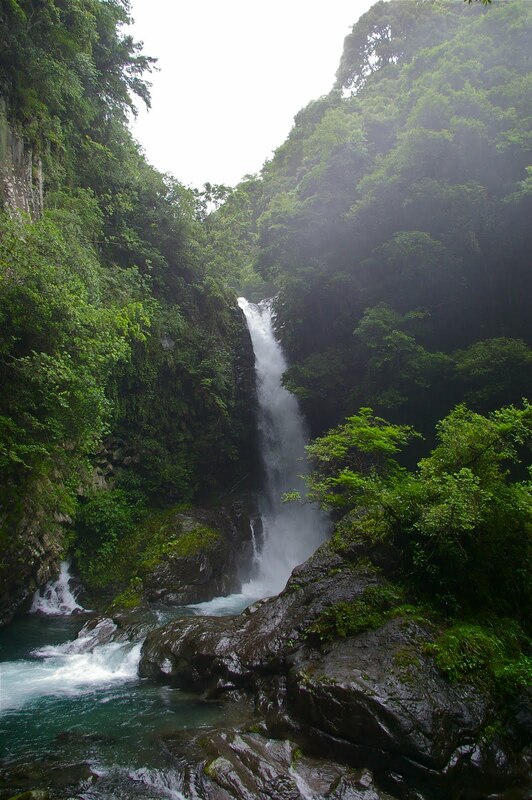 Still, I enjoyed viewing the waterfalls and hiking through the hilly forest. 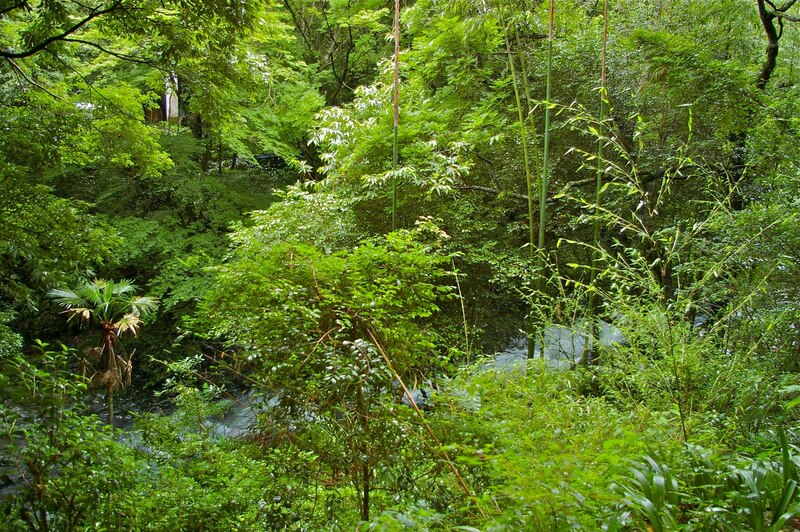 I wanted to make a photo of me in the bamboo forest but didn’t have much time to go away from the hiking trail. I didn’t see any deer like the last time, but there was another beautiful and much more frequent encounter: a huge black butterfly the size of a small bird. 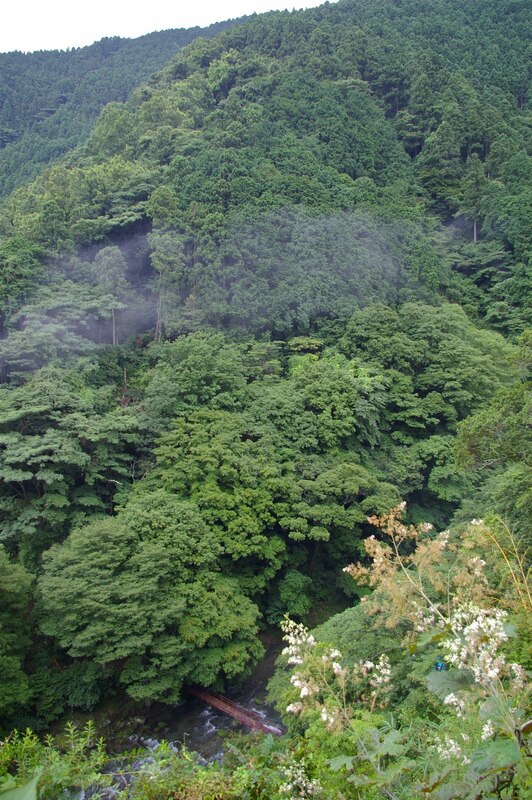 This is a cloud of steam coming from the hot springs. It was quite hot, but I was looking forward to a warm bath after getting wet in the drizzle (though it wasn’t so bad thanks to an umbrella that the woman from the information desk at Kawazu train station gave me). I couldn’t wait to go to the same onsen as the last time, called Amagiso, as it was right on the bank of the river next to the last of 7 waterfalls. But unfortunately it was closed, although it was just a quarter past 4! Unusually for Japan, the staff didn’t even bother to explain it to me in a polite form, so I just went to another onsen few meters away. I could still see some people in open-air hot springs of Amagiso, but to my disappointment they were all in swimsuits, which I didn’t take with me, so probably it was a good idea to go to another spot. So the neighboring onsen did not have such a nice view of the waterfalls (I could only hear them, but it had somewhat more traditionally decorated pool. And I had it all for myself! It felt fantastic to soak in this hot bath during the rain. For directions, check out my first post about this area.